The decision is instrumental because central government was fighting against it. They were of the opinion that government has full right over the body of the citizen in lieu of the grants given to them. 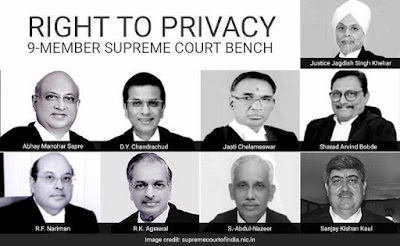 They believed that privacy is an elite class issue and economic backward class needs food more than privacy which was completely overruled by the bench saying the constitution grants this right in every other right and even at the places where it has maintained the Golden Silence. The ruling is historical and will effect other pending cases. First being the provision of making Aadhar mandatory. By doing so government want to keep surveillance on each individual without his or her consent. The issue of removing article 377 which deals with rights of homosexuals will now be seen in a new light. Beef Ban, Liquor Ban, Particular dress code orders and many more such issues are getting new life with this judgement. The citizen with this milestone judgement has won against the government and its ideas of suppressing individualistic choices. 'Main Chahe Ye Karun Main Chahe Wo Karun Meri Marzi' but off course it is not absolute and like other rights has limitations under particular situations. This is second ruling in this week after Instant Triple Talaq verdict which has made our democracy stronger. Not America , not Europe but India has shown the way to the world this time. 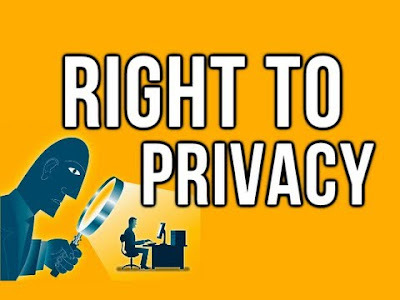 I am sure this will increase the pressure on other world governments to grant this right to its people. The governments usually deny this right because it makes people stronger than the government. But in democracy people should always be stronger to question government at each step. Now we can do whatever we like keeping in mind well being of others. It is my right to choose who to vote, which ideology to follow, who to marry and so on. Government neither indicate not interfere in my these decisions by bribing or beating or forcing me. India is great. Till next post God Bless India. The judgment comes at the right time that will trigger so many things whether article 377 that must be quashed which dates back to the colonial era on rights of homosexuals, freedom what to eat and our fundamental values. Rightly said, it's not something elitist when we speak about our rights, embedded in the Indian constitution. Braid Cutting - Truth or Rumors?